DEDICATED TO A VERY SPECIAL FRIEND OF MINE AT MOJOKERTO AND THE HEREUNDER MENTIONED FAMILIES KNAAP/WIDJAJA/LANDEGENT. I COULD NOT HAVE WRITTEN AND DONE MY RESEARCH WITHOUT THE HELP OF THIS SPECIAL FRIEND OF MINE AND I AM GRATEFUL. Semampir area which was once the place of my parents, but they are not buried here. 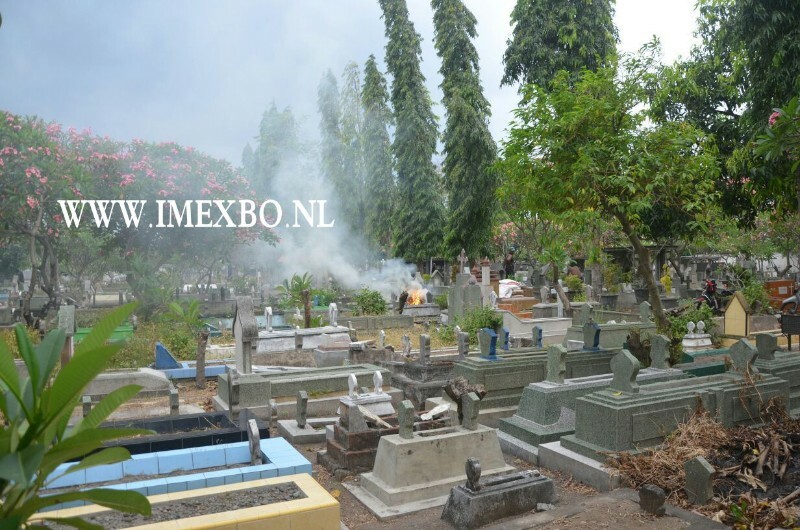 Many graves of the Europeans had been renovated as much as possible and remained on this place and some had been removed to Gunung Klotok Graveyards and many more are lost forever. 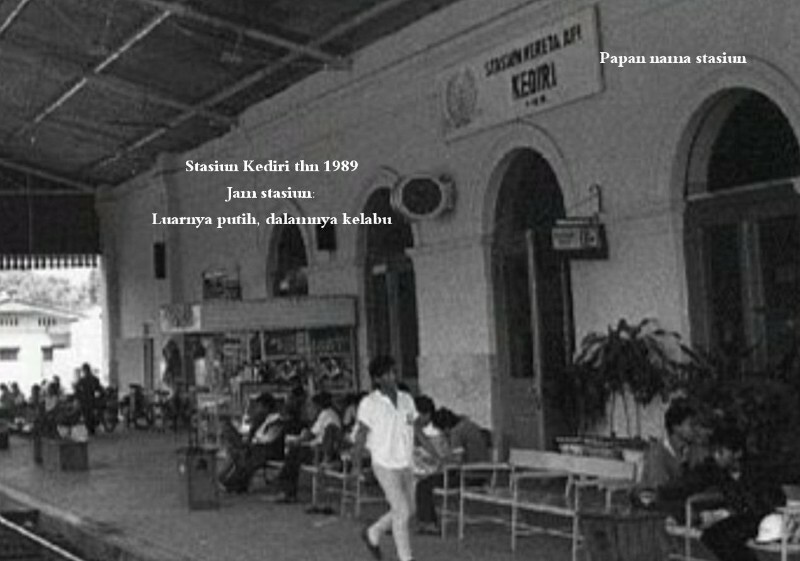 A journey by train called DHOHO... from Mojokerto via Kertosono to Kediri and v.v. 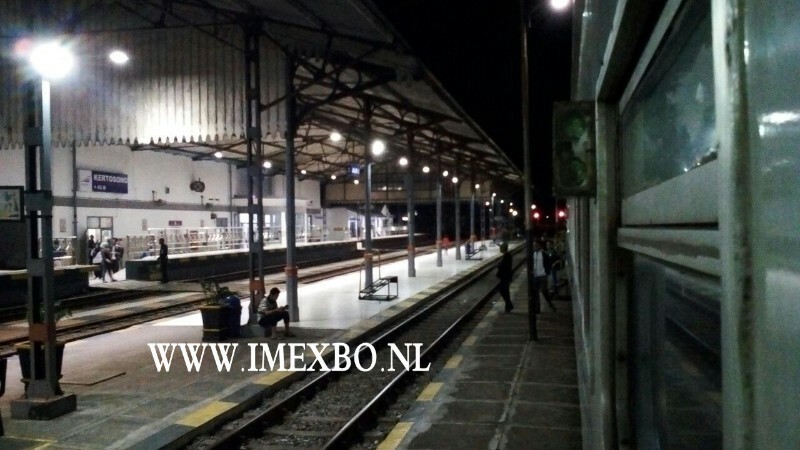 29 sept 2017 Train station Kediri 's at 10 to 6 pm Kediri, the place to be....the place where I was born.... The place where my father met his fate/destiny and his grave is no more. My holy grounds fertilized by the Gunung Kelud. I am a son of the ancient city of the Empire of Kediri. Almost the same view as it was in 1989. Mind the clock ! Reversed coloured and mind the signboard. Visitor's chairs are renewed and the ceilings had been painted in reverse too. New tiles on the floor.... The station had been well removated. My compliments to the Townhall of Kediri. Waiting at KERTOSONO station till the train/loc is prepared for the rest of the journey. The station is a bit abandoned...Friday evening 29 sept 2017 at one minute past seven. Thank you from the bottom of my heart, my dearest friend ever. Because you made your voyage and made some moments of Kediri for me.... I am granted these pictures for free and therefore my copyright is added to the pictures. A picture of the scene at location; in eternal peace all religions are together and bow their heads for the Lord/God/Allah. MARIA EVELINE LOUISETTE KNAAP. She indeed was mentioned in the almanacs. 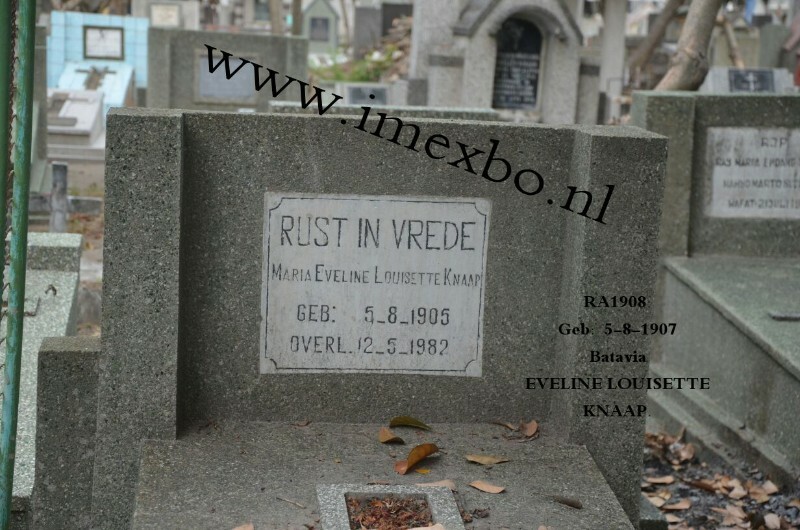 However, the text on her grave differs. 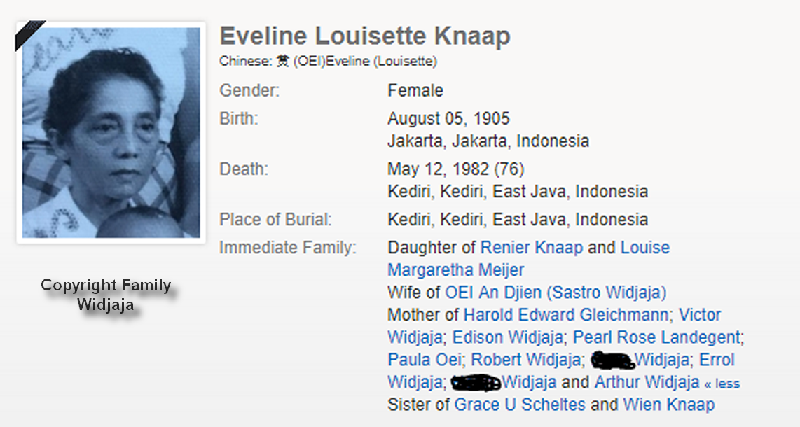 According the almanac the correct name was EVELINE LOUISETTE KNAAP and correct date of birth was 5th Aug 1907 and born in Batavia/Jakarta. Daughter's name: Grave: Maria additional. 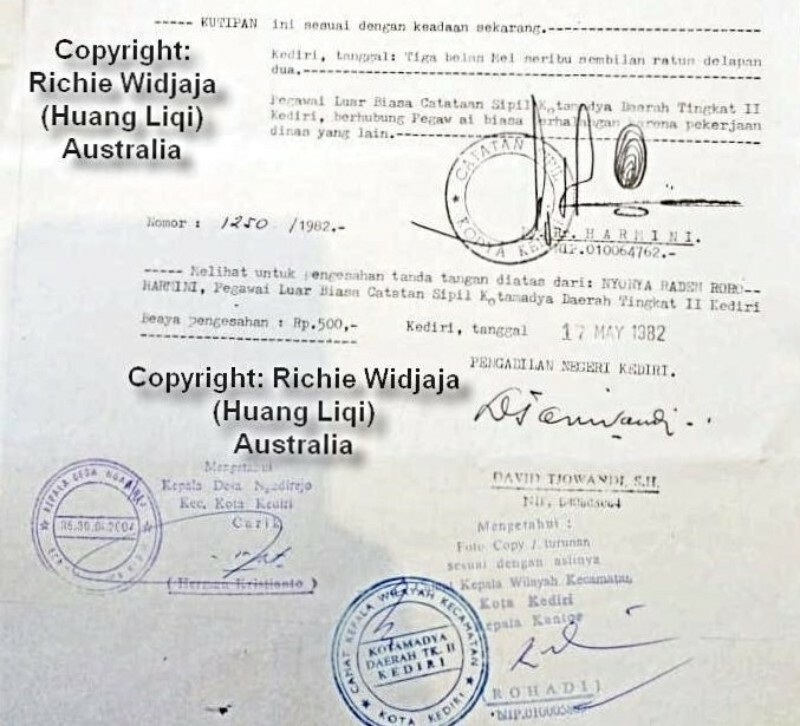 According the certificate Maria Eveline Louisette Knaap was married to Mr. Oei An Djien and this married couple had 8 children.(.. 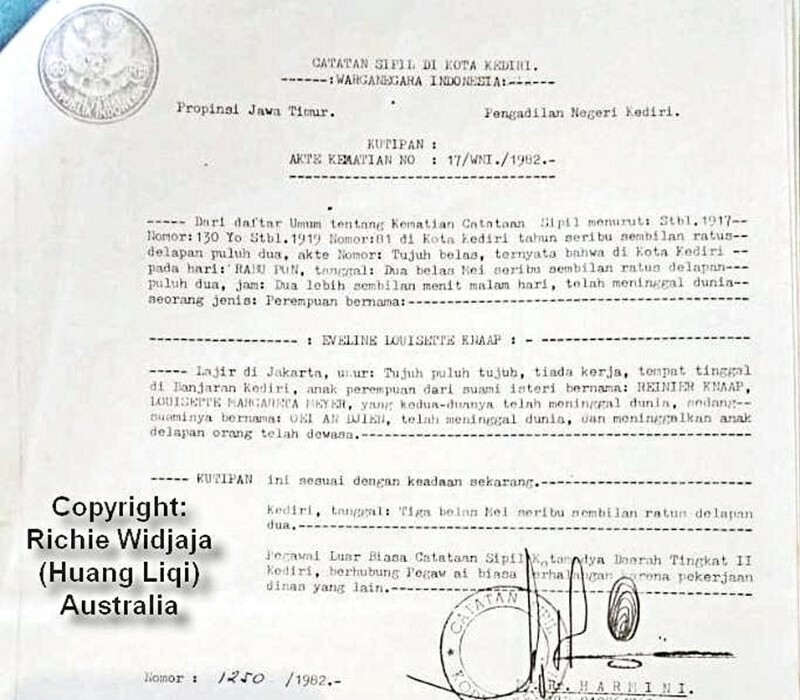 dan meninggalkan anak delapan orang telah dewasa...). As this number differs from the statement of grandson Richie, this could mean that one child died prior to the mother's death.?
" Eveline married twice in her life: First to J.A.G Gleichman then to a Chinese man named Oei An Djien (who was buried next to Eveline at Semampir). Oei An Djien and Eveline had 9 children. The youngest one was named Victor Oei (my father). 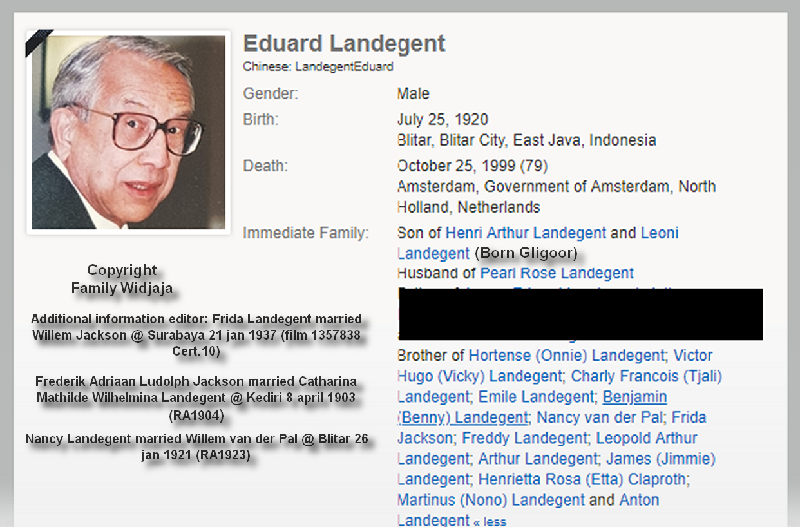 A daughter of Eveline/Oei An Djien named Pearl married Edvard Landegent (Editor: Eduard Landegent born Blitar 25-7-1920 RA1921 - See under additional information LANDEGENT on this page) and returned to Holland. This branch of my family is now based in Amsterdam." Son Harold Edward Gleichmann was her child out of her marriage to J.A.G. Gleichmann and he remarried in 1951 Mrs. JASMI. (Vrije Pers 30-1-1951 Period 20-27 January 1951). 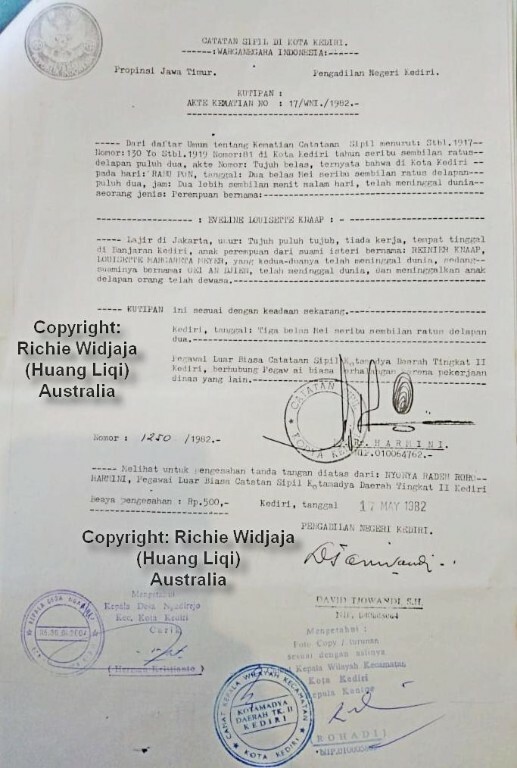 Harold was born 6 july 1931 at Kediri (Indische Crt 7-7-1931). J.A.G. Gleichmann was registered 14 juli 1938 at Soerabaya address: Derxdwarsstraat IV/232...(De Derxdwarsstraten waren zijstraten van de Derxstraat en deze lagen in de buurt Pacarkeling.) Indische Crt 9 may 1925: Married J.A.G. Gleichmann en E.L. Knaap te Soerabaja. Graves of M. Landegent-van der Wijst en H. Landegent. Weduwe F.L.C. Landegent - geboren M.M. van der Wijst - employee SF ADIWERNA te TEGAL en in 1927 woonachtig in KEDIRI. Geboren Batavia MARGARETHA MARIA VAN DER WIJST 31 maart 1893. F.L.C. LANDEGENT werkzaam bij de Post te Solo o.a. in 1894. In 1898 eervol ontslag. Gehuwd F.L.C. LANDEGENT 20-3-1898 met JENNY SMITH te Surabaya. 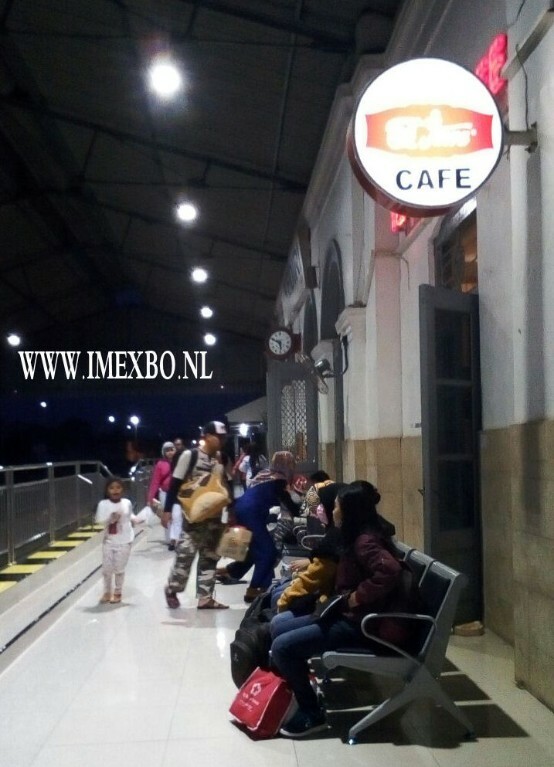 Tijdens verloving was hij te Kediri en zij te Surabaya. Leonie Gligoor descends from KOUTHOOFD and FLORUS. Their son Freddy Landegent imprisonment Japanese war. A link to the travelblog of Family de Meijer. Sommige namen op scheefgezakte kruizen hebben voor Pa een vaag bekende klank: Landegent Gligoor, Wouterbeek, Van Duinen, Kraus. Al op weg naar Blitar herinneren wij dat wij ook nog het oude kerkhof willen bezoeken. Op dat kerkhof zijn de ouders van Opa de Meijer en de na tien dagen overleden oudste broer van Pa - George - begraven. Additional infor editor regarding the above extract of the travelblog of Mr. de Meijer.-----> RA1913/16: Marriage Pieter Hendrik Voogd and Theodora Wilhelmina de Meijer at Kediri 29 nov 1911. UNDER CONSTRUCTION DUE TO NEWLY RECEIVED INFORMATION. May they all rest in eternal peace.